If you are big on travelling and road tripping, you may have considered buying an RV, or recreational vehicle, at some point in time. The thought of being able to camp in luxury, or avoid costly hotel stays probably sounds very appealing. However, buying an RV is a big purchase – a commitment similar to buying a house. Here is what you need to know about buying an RV. The first thing you need to consider about buying an RV is the initial costs. RVs are traditionally very expensive, even if you buy used. Most people get a recreational vehicle loan, but even with this loan, there will be a down payment required. And to make matters worse, the interest on an RV loan is usually higher than a typical car or home loan. It’s also important to remember that, just like buying a car, the moment you drive that RV off the low, it loses value. So don’t think of your RV as an investment like a home would be. RVs also have a lot of ongoing costs associated with them, just like any other home or vehicle. First, there are the essentials of owning an RV. You need to register your vehicle with your state department of motor vehicles. 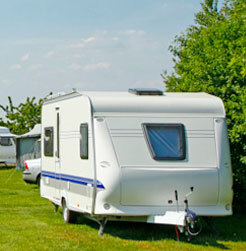 You will also need to find insurance for your RV, like what is offered by Simple Caravan Insurance. With insurance, it is important to remember that liability insurance is usually required by your state, and the cost directly related to your driving history and mileage put on the vehicle. Most RV owners also opt for casualty and comprehensive insurance as well, which is proportional to the cost of the RV. You also need to remember that you will have to pay for gas for your RV, and you will have ongoing maintenance costs as well. All of these expenses add up to make owning an RV an expensive proposition, so think about doing it long and hard before you commit. This entry was posted in Travel on September 8, 2012 by Yami.